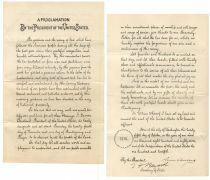 ﻿﻿SCOTT J. WINSLOW ASSOCIATES INC.
actively handles a wide variety of historical American collectibles specializing in autographs, manuscripts, stocks and bonds, paper money and a wide variety of historical americana. Since 1985, we have successfully served an extensive client base, including museums, libraries, universities, and private collectors. We have paid many millions of dollars for documents, ranging from one piece to major collections involving thousands of items. Enter your email address below to receive first notification of new acquisitions and collections! For Hotel Information Call 800-227-6963 and Mention Code "ANC"
We are a member of numerous major trade organizations including the Manuscript Society and the prestigious Professional Autograph Dealers Association. Mr. Winslow has been involved in the paper collectibles business for over thirty years and has given numerous talks to various groups on paper collectibles. Additionally, he has been consulted in the identification of forged securities and historical documents and is a co-founder of PASS-CO, L.L.C., an authentication and grading firm.